"It is blessed, and it serves as food." It is the best water on earth. It is also the most ancient water on earth because it was discovered about five thousand years ago. According to laboratory analysis, it is the most pure water on earth. Moreover, it functions as food and as a cure for diseases as mentioned by the Prophet, sallallaahu `alayhi wa sallam ( may Allaah exalt his mention ). In addition, it is found in the most sacred place on earth. Is there any other source of water on earth that can rival its virtues? The existence of water in this barren valley was an honor that Allaah The Almighty bestowed upon Ismaa‘eel (Ishmael) may Allaah exalt his mention and his mother Haajar (Hagar), may Allaah exalt their mention, and for everyone who inhabits or visits this blessed City of Makkah. This water is a reason for the prosperity and life of Makkah and one of the manifest signs in the Holy Sanctuary. According to the Sunnah (Prophetic tradition), one should say “Bismillaah (in the Name of Allaah)” before drinking, “Al-Hamdulillaah (Praise be to Allaah)” after drinking, taking breath three times outside the utensil while drinking, drinking to one’s fill and supplicating Allaah The Almighty for the good of the worldly life and the Hereafter. 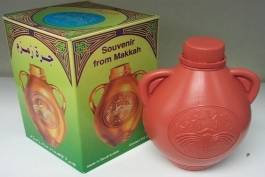 These are some Hadeeths about the virtue of Zamzam clarifying its goodness and blessings. 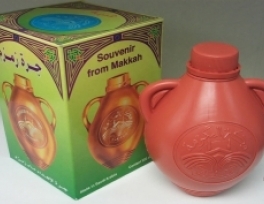 So, dear pilgrim, be keen on drinking to your fill from Zamzam water and to supplicate Allaah The Almighty with whatever goodness that you wish for in the worldly life and the Hereafter. Do you eat the sunnah way?